Popular single room modern style pub in the back streets close to the busy Western Road. 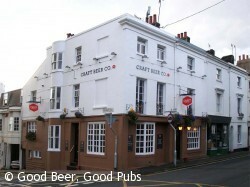 I’ve often visited the Craft Beer Company’s pub in Leather Lane in the Holborn area of London and I was delighted when they opened this pub in Brighton during 2012. Up until then the pub was known as the Florist – and inviting pub that was unfortunately let down by poor beer quality. Those of you who are familiar with the Craft Beer Company’s offering will not be surprised to hear that cask beers nestle alongside a selection of keg craft beers. The real ale selection is eclectic and the bar staff are happy to let you try any of the beers on offer. The beers are well-kept. Food is also available but I’ve not eaten here. The pub is about 10 minutes walk from Brighton station but is certainly worth the trip and can be combined with a visit to the Temple Bar in Western Road and the The Hampton Arms further down Upper North Street.